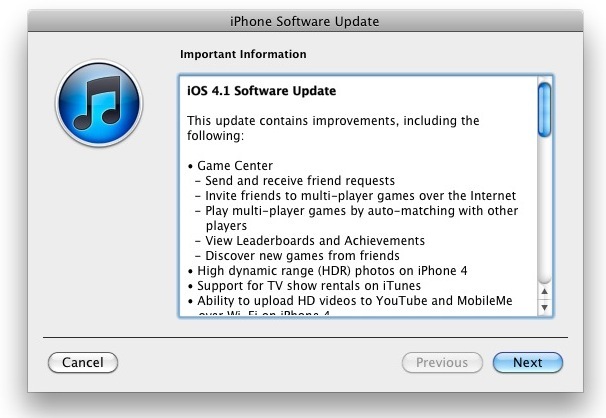 As expected, the iOS 4.1 release date is today so fire up iTunes, since everyone can now download iOS 4.1. The update comes in around 300mb and brings a number of new features to iOS including Game Center, Ping Support, various bug improvements (including improving the speed of iPhone 3G and resolving proximity issues). Your iPhone or iPod touch will then reboot and you’ll be running the latest version of iOS. Developers have had access to iOS 4.1 since September 1, but the iPhone and iPod touch operating system update is only now widely available to the rest of the world. The availability of the update couldn’t have come soon enough for iPhone 3G owners, who have been suffering under the miserable performance of iOS 4 on their older and less powerful iPhones. I want to Download iOS 4.1 for iPad. Yes iOS 4.1 works fine if you have a device already currently running iOS 4.1, but you can not download it to run now on devices that are running newer iOS versions. But once a device is running a newer version, it can’t downgrade to these old versions. That’s how Apple set it up.